Capacitor with flat plug connection for the operation of single-phase AC motors, e.g. Of grinding machines, concrete mixers, wire rope hoists. Metalized film capacitor inside a self-extinguishing plastic case (V2) with flat plug connection and base screw. The voltage information refers to the dielectric strength and not the operating voltage. The capacitor can be used with a 230V AC motor. Capacitors have electrically 2 connections. Capacitors with 4 flat plugs have 2 flat plugs which are connected electrically. 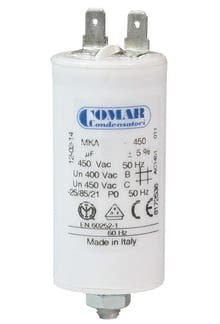 The polarity does not matter when installing operating capacitors. The delivery time applies to deliveries to Germany.